GTLC, Inc. & iLogBook, Inc.
Software consulting firm for Fortune 500 companies and medium size business. Companies included Johnson & Johnson, Osage, Surgicos, El Paso Energy, Azar Nuts, Hunt Companies, Data Conversion Specialist and University of Texas, El Paso Community College and others. Hunt Companies interface for an S-Curve Projections of Construction Projects from JD Edwards. S-Curve Projection is done to allow project managers to reshape their specific projection curves. Various Project Managers reshape their curve based on their estimation, thereby changing the larger S-Curves for a Project. The reallocation of the curves allows reporting to Surety Providers to get new bonding on large scale projects usually exceeding 100M. Complete Intranet site built to maintain supporting tables in DotNetNuke with extensive S Curve capability with bonding reallocation. My firm was brought in after the first consultants failed to deliver the interface. Hunt then requested a Land Development project that is used to track the project management of there land projects for around the country. EPCC & UTEP TitleV Communication structure and system – architected, designed, built system to allow the universities using Banner and Banner data warehouse to communicate via web services that shows Application Status for both institutions, Financial Aid & Need, Admissions, Degrees Planning, Course, Student Award Letters combined side by side with printable award letters. Grant was for 5M with main focus of grant to show this information side by side, along with at demand Student Award Letters for both universities and missing enrollment pieces. Single Sign On (SSO) system that allows users one place to sign into the many diverse university systems. SSO is a security architecture that allows users to sign-on once rather than having to re-enter their authentication credentials each time they need to gain access to a different application. With SSO, the user is authenticated when the user initially accesses the portal, but is then seamlessly granted access to all authorized applications. These applications included Computer Associates CleverPath, Microsoft Exchange, WebCT, Banner, Sun iPlanet, internal WebPortal, etc. See initial presentation. In the process I identified security flaws in IE that Microsoft had to address in later releases of IE. I showed staff how to implement trusted connections for their .NET solutions. Online Leave Request built system that allows staff to record Online Leave Requests, then have various roles approve, deny, finalize, etc. The process then takes the information in not normalized to a COBOL UT system to allow leave system to record to employees time records. Online Course System this system is geared to ease the use of online course building for professors. The system involves talking to the Banners system (Oracle) to provide the professor with the ability to create an online course for their class with a much easier methodology that the more complicated systems such as WebCT or Blackboard. It provides the ability for students to access there classes from within this same place or within my.utep.edu. The solution has the ability to build content from prior courses and templates that the professor defines. The ability to share resources from other classes (internally and external) such as video, etc is in the process of being architected. Web Portals – Modules developed were placed in a toolkit that can be accessed and used by each department to rapidly assemble their respective departmental and student web sites. When complete, these sites have the same look and feel as the Web portal. UTEP was the first University to have a complete ADA site. I changed core open source .NET portal that the community adopted as its new core source code base. . This in effect allowed UTEP to be the largest user of DotNetNuke with more than 1500 portals. See initial press release. These modules were architected in a fashion to allow them to be used outside of .NET. This was done so these controls could share data access methods, but be used in third party systems such as Computer Associates Cleverpath Portal (ASP or JSP) and our own internal portal. Controls such as a student’s grade point average to date, his outstanding financial balances, etc. Faculty & Staff Directory – Online directory service that allows users to search for faculty and staff members by drilling-down through a list of departments. Sophisticated lookup components that can be added to any Web page. Automatic Email Account Creator – Receives a daily update from the university's admissions system and creates a unique account in Microsoft Active Directory and a corresponding Microsoft Exchange Mailbox. Online Admissions – Online undergraduate and graduate admissions applications that look and feel like the rest of the university Web site. DataMart/DataWarehouse - A complete data warehouse that provides the university with a repository of critical information that can be mined for Business Intelligence or Ad Hoc reporting. Police Parking Permits/Citations/Appeals – Extended the T2 PowerPark application by allowing faculty, staff and students of the university to purchase parking permits and pay or appeal parking citations Online. Credit Card Processing – Real time composite control that development staff uses to do all credit card processing. Key importance to the control is to properly account for the transaction within the University system (Banner) and insure the transaction completes properly. Invented, patented (image viewer) and developed the LogBook Database System and trademarked the name iLogBook®. The iLogBook®.system is a sophisticated flight logging tool that maintains and stores flight information for access by both pilots and government agencies. System has claims in Aviation, Marine, Scuba and other industries. (See Information Document). Contains more than 200+ Stored Procedures, 100+ Tables and 180,000+ lines of code. PDA versions of system. System contains many various composite, templated, user controls .NET. Recruited others to work on system, including one firm that invested in excess of $300,000 in development cycle. A Fortune 50 company and largest transporter of gas in the US. Build C++ objects and PowerBuilder frameworks (ancestor objects) that are used by other IS programmers. Evaluate new products and objects for the company. Programmed in Visual C++ using MFC, OLE 2, SDK, PowerBuilder, SQL Server/Sybase, SQL Server DB lib and Watcom. Designed and built the companies Bulletin Board System that external customers use. Wrote programs using SQL Server DB-Library (16/32 bit) for database loading, synchronizing, and accessing from a Windows DLL for PowerBuilder and NT Services. Application Frameworks (ancestor objects) in PowerBuilder for all developers to use. C++ Graphing DLL used by all new technology systems and software for external customers. C++ OLE 2 object that goes against a SQL Server database, with automation for some basic database functions in the object. Primary contact to Microsoft Premier Developers Services. Attended Annually: Microsoft Electronic Data Exchange, TechED, Microsoft WIN 32, PDC, Comdex. Analyze and Design computer system(s) used in the area of field gathering of natural gas. Systems built included Sql Database of hourly meter information to graphically show performance of the gathering system at different hourly times and historically. Other systems included a Contract Management System & a Project Tracking system. Analyze and Design computer system(s) used in the area of transportation & exchange of natural gas. Customer Accounting is one of 3 key systems that comprise the company business. It is used to account for all gas transported and sold on the company pipeline it also produced invoices. Processed multi-millions of dollars a month in gas balances either owed to El Paso or the client. Database Administrator for the largest database within the company (Approximately 500 programs and 70 tables). Administer for several other systems. Managed a team of analysts and programmers. Technical design supervision of 10 programmers. Languages & Databases: COBOL, HLI, PACE, Wang SQL, PARADOX, Access. Changed programs to run on different systems. Taught classes on programming in COBOL and UNIVAC Utilities to various White Sands Personnel. Worked on writing one of the first relational databases systems in the country: JPLDMS (Jet Propulsion Lab Database Management Systems/ WSDMS (White Sands Database Management Systems) . Operating Systems: UNIX, EXEC 8 LEVEL 37, TOPS-20, TRSDOS, MS-DOS. Databases: INFORMIX, WSDM Languages: PASCAL, FORTRAN 77, COBOL, and BASIC. Co-Founder of Aqua Reef Restaurant winner of 7 Readers Choice Awards. 2° Black Belt, Kenpo Karate – Actively working towards 3°. Expect 3° December 2012. Sign In Sky is a night aerial advertising business that uses similar technology as the Goodyear Blimp. We scroll messages from an aircraft. 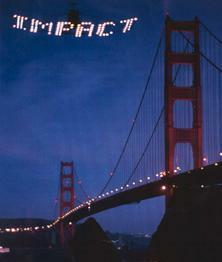 Messages can be seen over high-density traffic, sporting events, festivals, holiday events and more. We can operate anywhere in the United States. Let us be your Sign In Sky! We are a completely unique advertising medium and can get you results immediately. We can move to new markets at your request. The Goodyear airship has proven the effectiveness of electronic night aerial advertising for Goodyear products. There are other airships now in existence and several more being constructed at a cost of 3 to 5 million dollars, and with a cost to the advertiser of $250,000 to $300,000 per month as a standard fee, selling time on a monthly and annual basis only. Our sign meets a need for this advertising at a fraction of the costs associated with Airships.